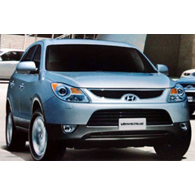 (autoinsidernews) - A few teaser photos of the 2007 Hyundai Veracruz have leaked onto the internet, ahead of the new SUVs official unveiling for the Korean market, reports Trend. While the Veracruz looks basically like we expected from the spy photos, to us, it is less appealing than we were hoping for. The Veracruz borrows many styling cues from the smaller Santa Fe, but something was lost during translation from the more appealing Santa Fe. The interior is clearly inspired by the Lexus RX, including the vertical air vents on the sides of the center stack. The Veracruz will be powered by a 3.8L V6 developing around 260-hp mated to a six-speed automatic transmission, and will be available in front-wheel or all-wheel drive. The Veracruz will feature a standard hide-away third-row seat, Electronic Stability Control (ESC), and Hyundai's standard package of six air bags, including side air bags, and side-curtain airbags for all three rows.